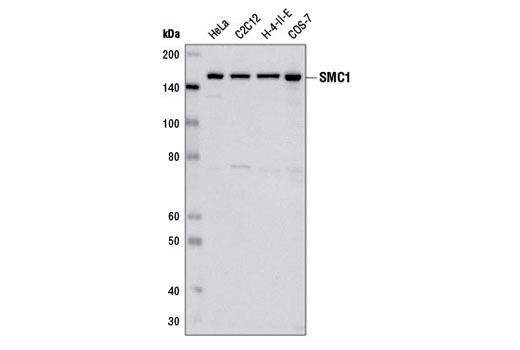 Western blot analysis of extracts from various cell lines using SMC1 (8E6) Mouse mAb. SMC1 (8E6) Mouse mAb recognizes endogenous levels of total SMC1 protein. Monoclonal antibody is produced by immunizing animals with recombinant protein specific to the amino terminus of human SMC1 protein. The cohesin complex consists of a heterodimer between SMC1 (SMC1A or B) and SMC3, bound by additional RAD21 and STAG proteins (STAG1, 2, or 3) (1,2). These proteins form a ring-like structure that mediates the cohesion of two sister chromatids after DNA replication in S phase (1,2). RAD21 and STAG2 are phosphorylated by Polo-like kinase (PLK) during prophase, which leads to the dissociation of cohesin complexes from the chromosome arms; however, cohesin remains bound to centromeres until anaphase (3,4). RAD21 is cleaved by separin/ESPL1 in anaphase, which leads to dissociation of the remaining cohesin from centromeres, enabling sister chromatids to segregate during mitosis (5). RAD21 is also cleaved by caspase-3 and caspase-7 during apoptosis, resulting in a 64 kDa carboxy-terminal cleavage product that translocates to the cytoplasm and may help to trigger apoptosis (6,7). In addition to mediating cohesion of sister chromatids, the cohesin complex plays important roles in gene regulation and DNA repair, as SMC1 and SMC3 are both phosphorylated by ATM and ATR kinases upon DNA damage (1,2). Peters, J.M. et al. (2008) Genes Dev 22, 3089-114. Barbero, J.L. (2009) Cell Mol Life Sci 66, 2025-35. Hoque, M.T. and Ishikawa, F. (2001) J Biol Chem 276, 5059-67. Hauf, S. et al. (2005) PLoS Biol 3, e69. Hauf, S. et al. (2001) Science 293, 1320-3. Pati, D. et al. (2002) Mol Cell Biol 22, 8267-77. Chen, F. et al. (2002) J Biol Chem 277, 16775-81.